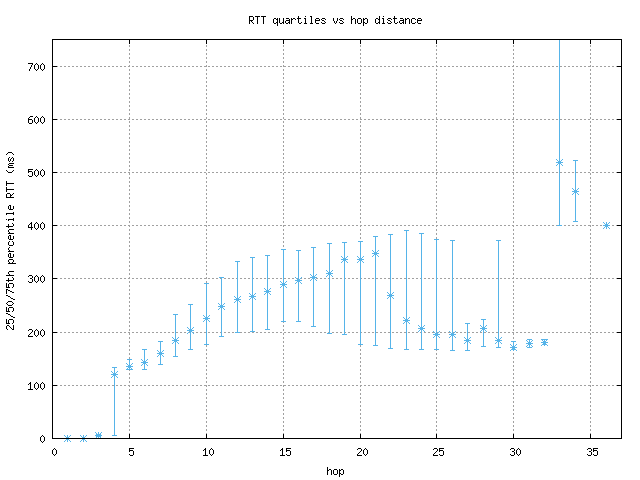 This graph shows the quartiles (25th, 50th, and 75th percentiles) of round-trip times (RTTs) found at each hop in a trace. This includes all probes, even ones that did not reach their destination. The y-axis cuts off values over 450ms, because of the occasional high-RTT result which skews the graph. By viewing the distribution of RTTs at each hop, we can gain a better sense of topological issues that contribute to high network latency. Typically, the first few hops are within the monitor's internal network and are very close to 0. Then there is usually a hop where the RTT values start to increase, and with each increasing hop, the range and median RTT values incrementally increase. The larger hops actually have decreased ranges of RTT values, because there are far fewer paths with that many hops in them. When a single hop has a large jump in the lower value of RTT, which no later hops go below, that typically indicates a slow (or heavily loaded) link common to many paths.